Will Real-Time Decisioning Save Big Data Analytics from Overblown Hype? IT is best seen as the latest in a series of broadly adopted technologies that have reshaped industry — from the steam engine and the railroad to the telegraph and the telephone to the electric generator and the internal combustion engine. . . All these technologies opened opportunities for forward-looking companies to gain real advantages. But as their availability increased and their cost decreased — as they became ubiquitous — they became commodity inputs. But love him or hate him, Carr raised a key point: there’s nothing magical about information technology. It’s subject to the same economic laws that rendered telegraph and horse carriage technology obsolete. In short, innovation and new value creation are essential to ensuring that IT still “matters”. So let’s get specific. Which IT systems are strategic to telecom today? How about billing and CRM? Well, those are certainly mission-critical. Ah, but just because something is mission-critical, does that make it strategic? Lots of other things are mission critical: how about electric lights, heat, air conditioning, and security ID cards? Let’s turn to analytics. Is that strategic? Well, in 2014, I authored a 500+ page analyst report on Telecom Big Data & Analytics. And in my research I chronicled the work of dozens of companies building dream machines that collect and analyze data. But scanning the horizon today, I don’t see the big value-creating breakthroughs you’d expect given all the hype there’s been around big data. So why is that? Well, one reason, I think, is that succeeding with telecom analytics is more than just collecting and analyzing data. It’s also about taking action — correct action — often in real-time and across a complex provisioning environment. Sure, we know that analytics has been quite successful in one-off marketing campaigns. But to me, the key strategic value comes when you use it to drive day-to-day actions. It’s about making decisions in context and driving that successfully into the network and back office systems. That’s what will save analytics and big data from being dissed as high-priced calculators in a world where compute-power is like oxygen. One company who specializes in this action-oriented, provisioning-friendly aspect of analytics and IT is Pegasystems. And joining us now to explain his company’s systems and software philosophy is Tom Erskine, head of marketing for its Communications and Media business unit. Dan Baker: Tom, it would be great if you first explain a little about Pegasystems. What market and customers do you serve? Tom Erskine: Dan, our core software platform, Pega 7, is serving a number of different vertical markets like banking, insurance, healthcare, and communications. In communications, we’ve built a customer experience platform for marketing, sales, ordering, and customer service applications. And we’ve had some significant success selling this concept into the Tier 1 market. For instance, Everything Everywhere in the UK uses our marketing applications to retain customers and up-sell/cross-sell. We also serve providers like Telecom Italia, Orange, Cox, Verizon Wireless, and DirecTV. What’s unique, I think, is we sell a single platform as opposed to a hodgepodge of acquired technology stitched together with API glue. It truly is a unified platform that is much faster to develop on and change than standard approaches. Conventional wisdom says that the systems that support marketing, CRM and customer service are mature and ingrained today. A Tier 1 operator is not going to make the move to something new unless it’s pretty compelling. So what are you offering that’s makes a difference? I think comparing the platform we sell to other offerings on the market will answer your question, Dan. If you look at a Siebel especially, and even Salesforce to some degree, the applications those companies sell are very data centric. They are built around a data architecture, not a business process flow. OK, so why is that distinction important? Well, it’s kind of the difference between designing an information system versus designing a next best action system. An information system is good at pulling data from a big database and presenting it to a customer or a customer service rep. But if you optimize the retrieval of information, your design is less flexible when it comes to modifying the next best actions you want to take. Now if the customer interaction is simple and the rate of change is slow, then a plain information system is fine. But when you deal with complex issues such as in B2B and serving enterprise customers, the strategic pivot point is around changing the processes, procedures and policies in that customer interaction. If you get those right, the data should take care of itself. Take a wireline customer move. If the customer wants to move his address, that is a pretty complicated process and so we provide the core ability to handle very complex cases like that easily and much of that expertise stems from our heritage as a BPM shop. So our philosophy is to get the data you need when you need it versus starting with data as the first premise. Think about the enterprise space where things get far more complicated. One order from a large enterprise could drive 1,500 different service orders with it. Why haven‘t the incumbent vendors developed the same process-centric capabilities that Pega has? With due respect to my former colleagues at places like Convergys, NetCracker, and at Amdocs and places like that, I think the approach of evolving a software platform through acquisition — and stitching together all the acquired companies into some type of “suite”-- is not the best. When you scratch the surface of that suite, it ends up being in a lot of integration cost for the customer and not very seamless: it doesn’t drive the best possible customer experience. Give you an example. Telstra still has a bunch of Siebel all over the organization, but what they have done is to layer a next generation, more agile layer on top of the core applications like Siebel. And those applications continue to run. It’s almost impossible to do a full replacement at a large carrier in our industry. Why? Because there is so much legacy and so much data in so many different places. This is not unique to communications, by the way. It’s the same in banking, healthcare, insurance, and other industries. Companies have hundreds of systems with data in them and the challenge is to get the data out and modernize the systems without ripping them out and replacing them. Can we get into some of the nuts and bolts? How are changes made in your system? Basically we allow the business and IT teams to collaborate using visual tools. The goal is to create an environment where the business and the IT teams work in a much more rapid and agile way to solve problems. And in that way, you can go from a release every six months to a release maybe every month or two months. That’s very important in a place like marketing or customer service because that side of the business evolves very fast. So, we’d say, “Send us your requirements document and in a couple weeks we’ll come back with statement of work, then we’ll design something, come back about a month later and ask: is this design what you’re looking for?” And that sort of iterative approach goes on for months and months, sometimes over a year. Compare that method with having the business and IT organization define their requirements right in the tool and actually build the application as they go. The second aspect of this is slightly more technical but it’s around the question of specialization. How do you enable treating customers in Los Angeles different from the way you treat customers in New York? The platform allows you to do that very easily without “forking the code” — or having to create a whole new version of the application that says: if the zip code is X, then do Y.
It’s all about taking the next best action — depending on the context. About five years ago, Pega acquired Chordiant who had pioneered the whole idea of NBA or next best action. And we have come up with a metaphor to describe this. It’s called the Situational Layer Cake. The cake’s base layer is all your company policies and procedures. And then you add other specialty layers on top: by geography, by product, by customer type, etc. Probably the best example of the application’s use is at American Express. If you call the American Express services organization anywhere in the world, they are running Pega. The software enables them to treat the customer differently whether it be Australia or New York, but the core application you are running is exactly the same. 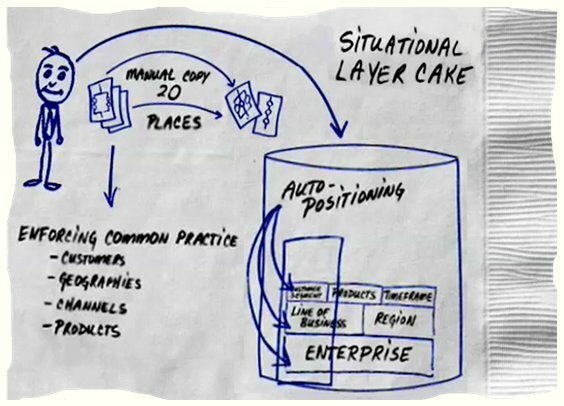 Tell me more about this Situational Layer Cake. How is it being used in telecom? Well, let’s say I have a Gold customer who speaks Spanish and has a quad play in Los Angeles. How do I handle that interaction for technical trouble-shooting in the best way? What sort of agent should handle the call? And how should these decisions differ from, say, handling a double-play customer in Philadelphia who speaks English? Layer cake allows you to specialize the experience based on those types of dimensions. The straight black-or-white policy decisions are easy. Where the layer cake comes in is where you pull in analytics and work with outcome probabilities. It’s used mostly in cross-sell, up-sell situations, or retention situations where a customer contacts you and goes through your website and you need to figure out in real-time what is the best product to present to the customer — or has the best chance of driving a successful outcome. In a case like that, you want to simultaneously score a bunch of offers. Some providers we work with may have 50 to 60 offers they could present to the customer, so which offer is best? — and which is the best for the customer right now? The classic case is retention — and that’s also the most sophisticated — because in a contact center environment, as you start asking questions of the customer, you are learning additional context that should drive the kind of offer you propose. Each of those answers significantly changes what the next best action might be. A 18 year veteran of the Communications and Media industry, Tom Erskine is currently the Communications and Media Global Business Line Leader for Pegasystems. In this role, he oversees the company’s go-to-market strategy and execution in the Communications and Media vertical market. Under his leadership the Communications and Media business has grown into one of Pega’s largest, serving 6 of the world’s 10 largest providers across wireline, wireless, and Pay TV segments . Prior to Pegasystems, Tom held senior marketing and product management roles with technology companies in the Communications and Media market, including Convergys Corporation and BCGI. Tom has also served in an advisory role for successful start-up organizations including BrandNetworks and WHERE.COM.